There are many, many restaurants in Rome. Every street has a variety of osterias, trattorias, bars (where you can have a coffee, cappucino, or a snack) and sometimes even a pizzaria. 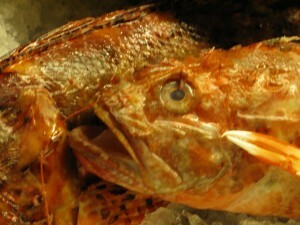 However, Osteria St. Ana is not just a restaurant, but an experience that one does not forget. So many restaurants have delicious food that you will swoon over, but it is the combination of ambience, staff. and food that leaves an lasting impression. For months before our trip, I enjoyed researching places to eat. I also emailed many restaurants inquiring as to their capabilities of preparing gluten free pasta. I found this restaurant close to where we stayed in Rome, so that on the first day of arrival, it would be convenient to find and enjoy a good meal. I emailed the owner asking for gluten free pasta, and he replied that he could provide it, so I went ahead with the reservation. When we arrived, he led us in to seat us and commented that I was the reservation that had requested gluten free pasta. I was very impressed that he remembered! 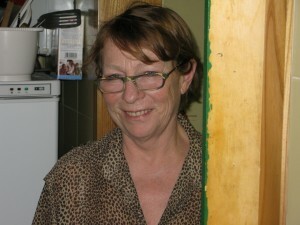 The food is amazing, prepared with love and many years of experience. You can dine al fresco or downstairs in their romantic lamp lit and candlelit dining room. The walls are covered with pictures of the owners (two brothers) and many celebrities and lesser known patrons. For appetizers, we sh ared smoked mozzarella and prosciutto with melon. Yummy! Wayne, my husband, had a fresh baked tuna steak with pomodoro and olives. 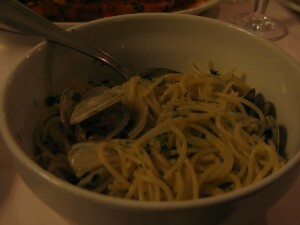 I ordered Spaghetti with Vongole (clam sauce), pictured here. It was heavenly. 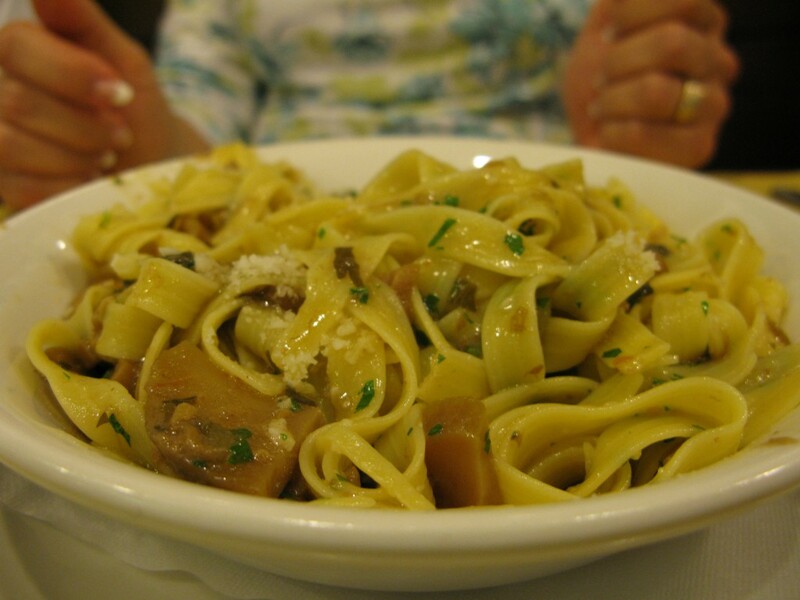 I was so happy to be eating gluten free pasta in Rome! My son, Alex, had Pasta Amatriciana (tomato sauce prepared with pancetta). I tasted the sauce, and it was scrumptious. 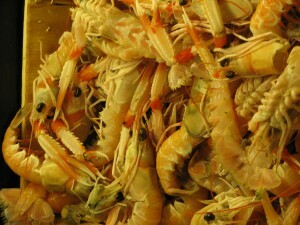 He followed with an entree of grilled Scampi (what Italians call langostinos). I don’t know where we found the room, but Alex and I ordered three desserts: creme caramel, fresh strawberries and cannoli. I was unable to eat the cannoli, but my creme caramel and strawberries were sublime! We were fussed over. We were made to feel like family. We were not rushed. They did not care if we sat there all evening. The waiters scurried around and we watched as they just could not be more accommodating to all! 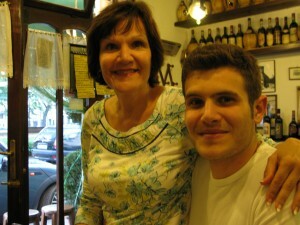 This gem of a Rome restaurant, Osteria St. Ana, on a street just off Piazza Popolo, made us feel so very special. Many generations of the same family have run this restaurant, and therefore, the food is unmistakeably cooked and served with much pride and love. I shall never forget our evening at Osteria St. Ana. It was and will continue to be a loving and lasting memory of my husband, my son, and I in beautiful Rome with delcious food, laughter, affection, and an ambiance of family tradition. And thank you, Roberto, for remembering my gluten free pasta! Grazie mille! Just inside the city limits of the foothills of Florence, one finds this unique trattoria (informal Italian restaurant) run by chef-owner Benedetta Vitali. 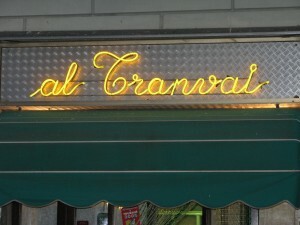 The 14C bus will drop you off practically right in front of the restaurant which is right off the Piazza di Carregi. The latter piece of advice actually came from Benedetta herself after I emailed her telling her that most likely we would not be visiting her restaurant, as I was told that the taxi ride cost over 50 euro round trip. lead you to your table, explain the menu and even serve you many of the dishes. 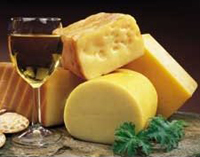 (contorno), and if you have space in your stomach, dolce (dessert) and cafe or coffee. Alex loved his octopus appetizer and black ink pappardelle with squid. He has been emailing all of his friends about it. 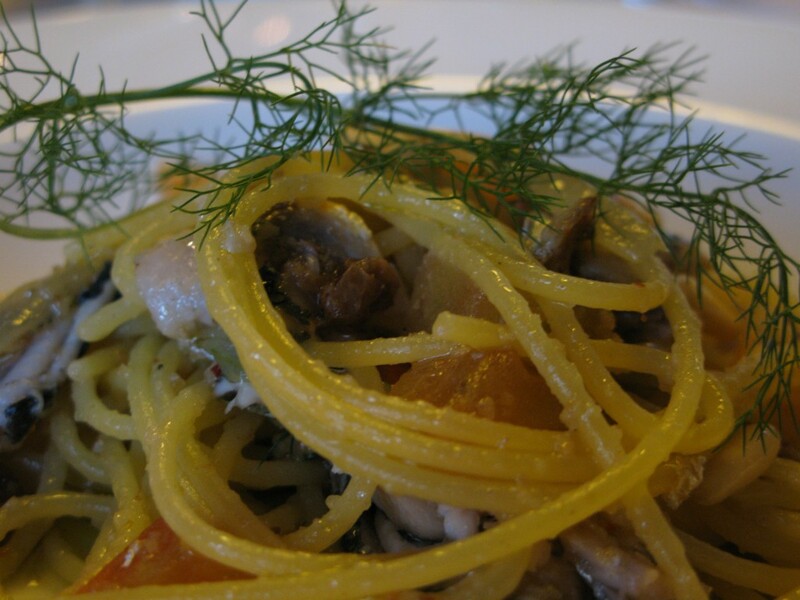 Wayne and I shared a gluten free spaghetti dish of fresh sardines pictured here). It was very delicious and I plan on trying my hand at this dish when I get home. Benedetta was supposed to share the recipe, but the restaurant became busy as we left, and we both inadvertently forgot about the promise. From what I could discern myself, this dish is a savory mixture of sardines, olive oil, pine nuts, sultana raisins, and just a hint of fresh fennel. Unfortunately, Benedetta said that she was out of gluten free bread, and admittedly, I was disappointed. I have not encountered any gluten free Italian bread since arriving in Italy just one week ago. 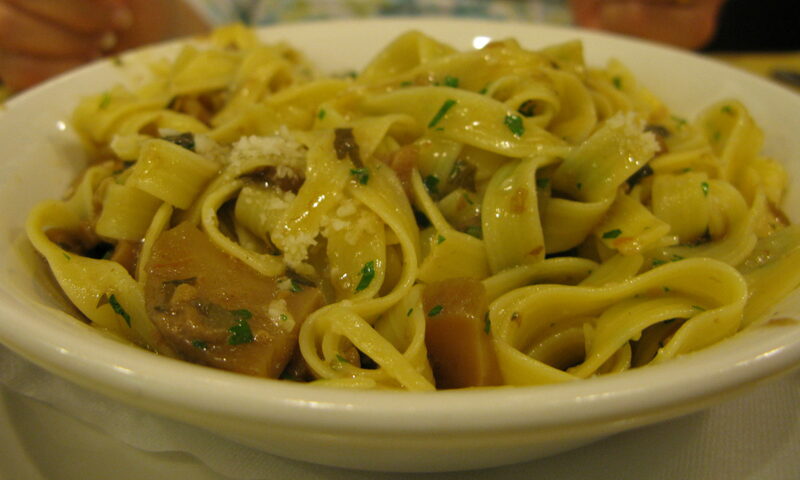 Most servers are quite familiar with “gluten free” pasta (pasta senza glutino), but the bread is hard to come by. We are now in Rome and I remain optimistic that I may finally get to taste gluten free bread in Italy. I was thinking about emailing Benedetta for the sardine recipe, but better yet, I do believe that I will take the creative approach and try my hand at it with my own personal improvisations. Recipe to follow on this blog. Viva Zibbibo Firenze! Thank you Benedetta. Pinch me. 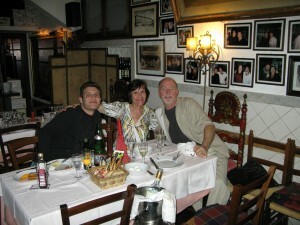 Here I am with my son and husband in beautiful Florence. This evening, we dined at a tiny trattoria that went through the trouble of cooking me an amazing and very memorable gluten free meal. This is not just any restaurant. This is a tiny place with about 7 tables and all the locals come, feast, chat a lot, and laugh a lot. The walls resound with the fullness of life. The chef pictured here with our wonderful server was so very proud to prepare for me Taglitelle (gluten free) with a rich mushroom sauce. Spectacular and so very delicous. 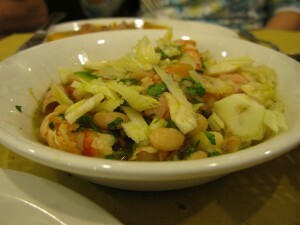 Oh, I almost forgot to mention the appetizer of fagioli with shrimp, vibrant with flavor and fresh herbs. It is a dish that I have never had before. My son took his bread and scraped up everylast bit of sauce. My husband also had the fagioli and then followed with penne pasta with sausage and wine sauce. culinary love he put into it. It was an evening never to be forgotten. Delicious. Happy. Being in the moment. Alex, my son, my husband, Wayne, and me together across the globe from home. neighborhood of Florence. And the best part-they love you gluten free and all! 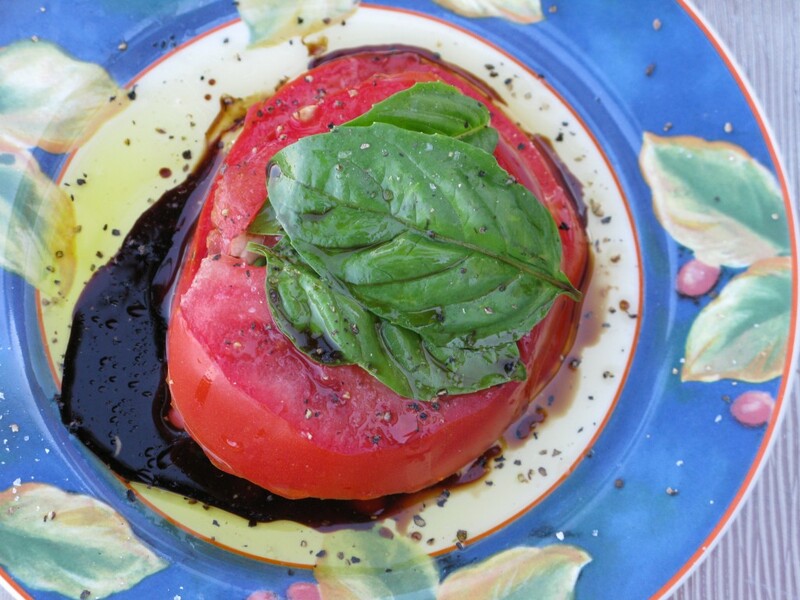 I truly don’t think that my ripe and sweet Florida Ruskin tomatoes ever thought they would be seasoned with real Balsamic vinegar from Italy. This is authentic Balsamic vinegar (il borgo del balsamico) aged in oak casks carried with love by Wayne’s sister, Debbie, all the way from the Emilia Romano region of Italy. The bottle is small and lovely and filled with this dark and precious vinegar. What a fabulous gift. It is so, so delicious. Debbie told us that sometimes Italians put this vinegar over ice cream or fresh strawberries. I haven’t tried that combo as yet. This evening I created the perfect tomato stack. I sliced a fresh, ripe Ruskin that I bought at my local produce market. I went outside and picked some perky Basil leaves fresh from our plants. They are doing really well. Wayne has grown a bunch of little basil plants from seedlings. They are really taking off now. I took out my pepper mill, extra virgin olive oil, Debbie’s Balsamic, and mozzarella cheese. First I placed a tomato slice on the plate, followed by a slice of mozzarella, then a basil leaf or two, then some cracked pepper, then another tomato slice on top, followed by more basil, and then olive oil and a sprinkling of vinegar, and salt and pepper to taste. Voila! The Ruskin meets exotic Italy tomato sandwich! I dedicate this delicious tomato creation to Wayne and his sister, Debbie. Debbie, thank you so much for thinking of us and for your thoughtfulness to carry this precious bottle of Balsamic all the way from Italy. And both Debbie and Wayne were raised in the Tampa area of Florida not very far where Ruskin tomatoes originate. And last but not least, Wayne planted the seeds that grew into this amazing sweet Basil pictured above. The tomato sandwich was sublime and truly an unexpected marriage of flavors. Thank you, Debbie, again, and thank you, Wayne. Thank you, Mom, for the gift of your beautiful plate (pictured above). I told him about my dream, and our trip there became two dreams come true, i.e. finding someone wonderful to share my life with and a visit to this amazingly beautiful stretch of towns built into the side of hills from Naples to Sorrento to Salerno. We encountered this eggplant dish at dinner one evening in our hotel. There was something very unique in flavor, and although we asked everyone along the way about the ingredients, everyone inadvertently omitted one of the most important ingredients. When we returned, I purchased the simple repertoire of eggplant, garlic, oil, mozzarella, plum tomatoes, and parmigiana cheese. I made the dish, and it looked fantastic. We both took a bite and simultaneously looked at eachother, and almost said together, “Something is missing”. I did a little more research and discovered that our rendition was missing “ “Mozzarella di Bufala Affumicato”, otherwise known as Smoked Buffalo Mozzarella. I made the dish again using smoked mozzarella (unfortunately not the imported Buffalo version), but it definitely put the punch back in the dish. Try this on your spouse, your friends, your family. It is a magical use of the incredible la melanzana, that is, eggplant. You will love it. Have all your ingredients chopped and lined up to go for this dish. Put your water onto boil for the pasta.When the water boils, drop your fresh whole tomatoes in the water for about 2 minutes.Remove and drain. Skin will come right off with a knife. Chop and set aside.Take half of the oil and sauté quickly diced eggplant. Set aside.Sauté chopped garlic in remainder of olive oil until tender; do not burn as it will make your sauce bitter. Keep moving it in the sizzling oil with a spatula or spoon.Add your chopped plum tomatoes juice and all. Simmer for a minute. 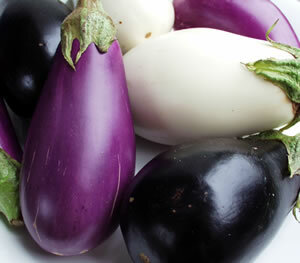 Add your eggplant.Add salt and freshly cracked pepper to taste. Cover and simmer for about 5 minutes.Salt your pasta water. Put your penne on to boil. When done, drain. Save about ¾ cup of the macaroni water when you drain the pasta.Put the drained pasta right into the skillet with the tomato/eggplant mixture. Add diced mozzarella cheeses, parmigiana to taste, freshly chopped basil and mix. Cover, turn off heat and let the cheeses melt into the pasta. You may need to add just a little macaroni water. You be the judge of that.Serve immediately. (A nice salad, crusty Italian bread and table wine would complete the meal).